Turquoise and Lava stone necklace with Bracelet. 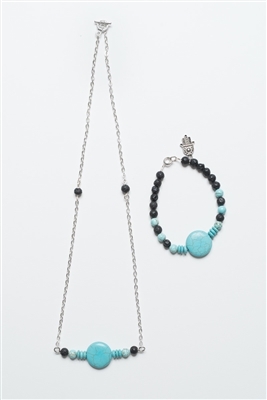 Handmade Necklace with Turquoise and Lava stone. The healing powers of Turquoise can benefit the whole body, with special strengths in healing ailments of the immune and respiratory. The bracelet has a Hamsa charm which brings its owner happiness, luck, health, and good fortune. The length of the necklace is 23".